The Ryzen 7 1800X delivers eight fast cores at a reasonable price, and puts AMD back into competition with Intel. It’s no secret that the battle between AMD and Intel has become more of a rout. Strapped for cash and forced to sell off its production facilities, AMD’s chips have fallen further behind with each passing year. The attempt to remain competitive through price cuts hasn’t worked, and new PCs powered by an AMD processor have become a rarity. The company has been in desperate need for a new chip, based on a new architecture. Ryzen is the result of years of work, and is the cornerstone of AMD’s new strategy, which focuses on providing enthusiast-level hardware that cuts into price points where its opponents are weak. 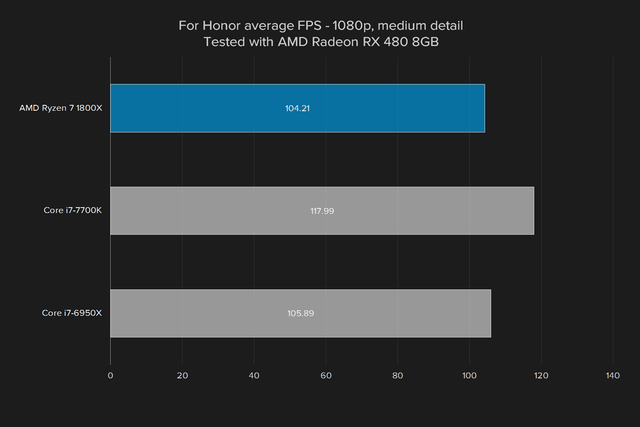 AMD did exactly that with the RX 460, 470, and 480, with some success. Now, Ryzen is using the same approach against Intel, striking at the Core chips that offer the least value. 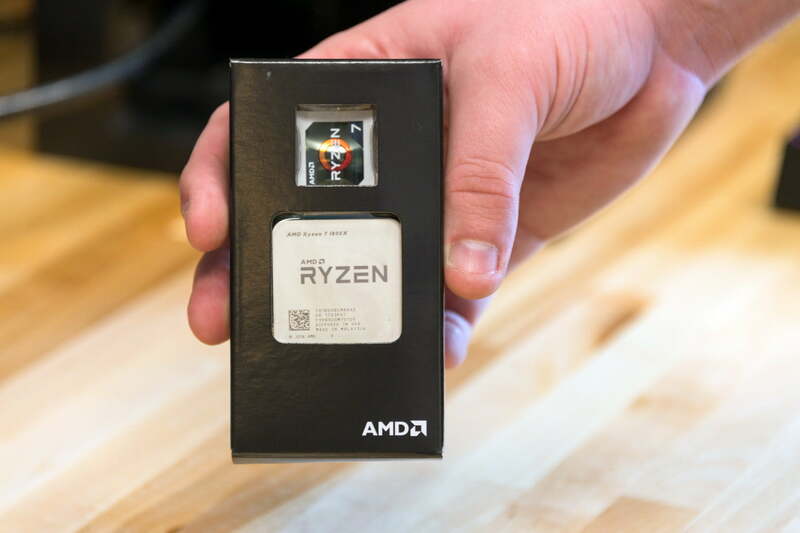 That said, the debut Ryzen chips – the 7 Series – are not the bargain hardware you might be used to seeing from AMD. They start at $329 for the Ryzen 7 1700, and run up to $500 for the 7 1800X. While that’s far less than Intel’s most expensive processor — the Core i7-6950X, which sells for $1,500 — it’s far more than most people are willing to spend on a CPU. 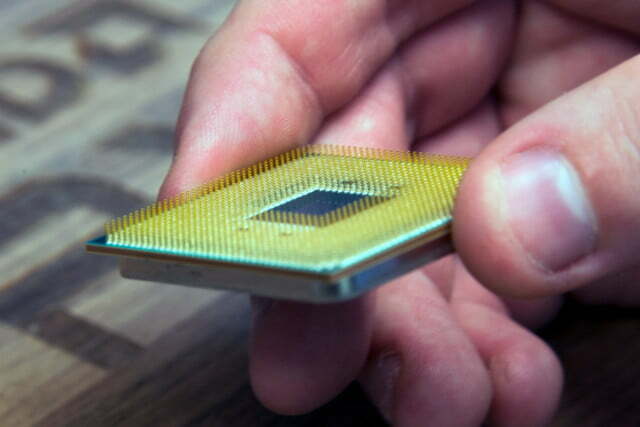 That puts Intel’s fastest hardware square in AMD’s sights. This is as classic an example of David vs. Goliath as you’ll find. So, is Ryzen the stone AMD uses to fell Intel? Or does David end up beaten to a pulp? Ryzen is the first iteration of Zen, a “clean sheet” architecture from AMD, which makes it immediately remarkable. AMD and Intel debut new architectures on a regular basis, but they are almost always tweaks of a previous design. 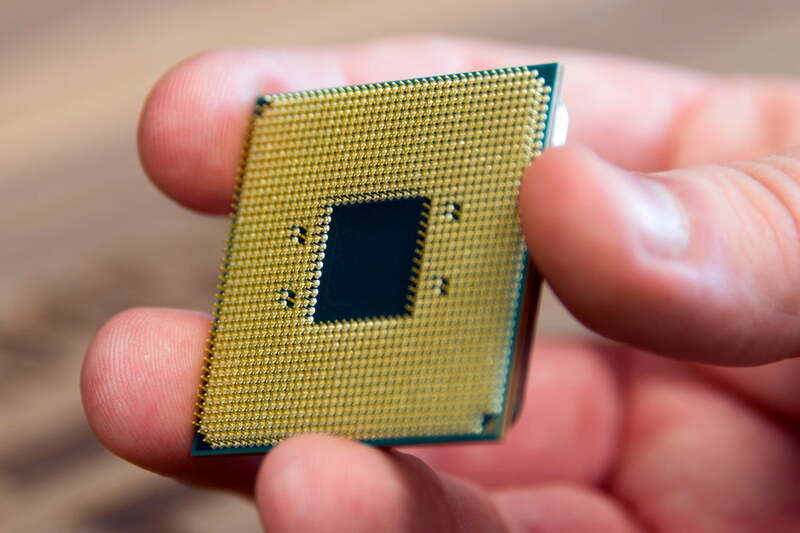 Intel’s current Core processors, for example, trace their lineage back to at least 2006, and some might argue them a continuation of the architecture used by mid-90s Pentium processors. Improving “instructions per clock” (IPC) performance is a focus of Zen. This is where AMD has tripped in the recent past, so the company has selected a larger instruction scheduler window and greater issue width. It’s also added a “micro-op cache” that lets the chip bypass the L2 and L3 cache when it needs to grab a frequently used operation. Further, Zen uses “neural network-based branch prediction” to more efficiently prepare operations. To put it more simply, the new architecture is designed to work smarter, not harder, by helping operations flow smoothly through the chip. Zen targeted a 40 percent improvement in IPC over AMD’s previous chips, and the company says it beat that target, hitting a 52 percent gain. That’s massive, but it will be needed, given Intel’s major lead in this area. Smarter execution is only half that battle. AMD has stressed the need to “feed the beast” by ensuring required data is available when called for. To achieve that, AMD’s new cache hierarchy includes 64KB of L1 instruction and data caches, 512KB of dedicated L2 cache per core, and 8MB of L3 cache per four cores. This allows AMD to claim 20MB of cache for every Ryzen 7 processor, which is substantial. By contrast, an Intel Core i7-7700K has an 8MB cache, and the Intel Core i7-6800K has a 15MB cache. Only the Core i7-6950X has a larger cache, at 25MB. Zen’s large cache means it can store a lot of relevant data inside the processor, which decreases the need to bring in data from RAM or hard disk, both of which are slow by comparison. AM4 may give those who jump on Ryzen the chance to upgrade later without buying a new motherboard. AMD sold off its foundry business several years ago, which meant it had to rely on other companies to produce its chips. That seemed likely to leave the company perpetually behind Intel, which builds its own fabrication plants, but recent stalls in Intel’s production process has left a window of opportunity. Zen presses that advantage, and is built on a 14nm FinFET process at Global Foundries. Intel’s chips are also built on a 14nm process. A smaller production process tends to improve efficiency, and that’s certainly true with Zen. The company’s chips claim a thermal design power of 95 watts for the 1800X and 1700X, and 65 watts for the 1700, which means they will fit into the same systems that can host Intel’s Core i7-7700K. Yet the Ryzen chips have more cores. 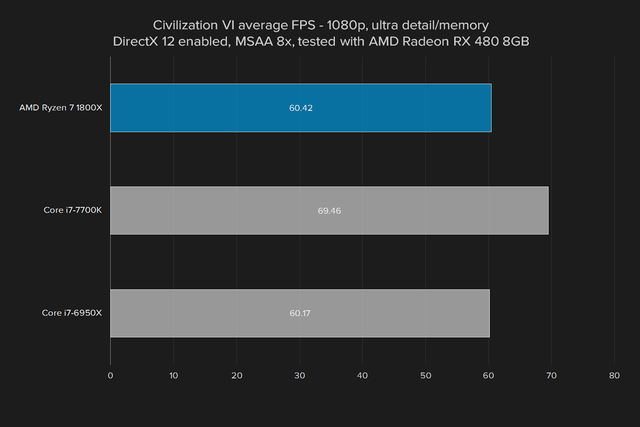 It’s hard to say exactly which chip is more efficient without extremely in-depth power consumption tests, but AMD has clearly closed the gap with, if not exceeded, Intel. An all-new processor design also means the introduction of an all-new platform – AM4. 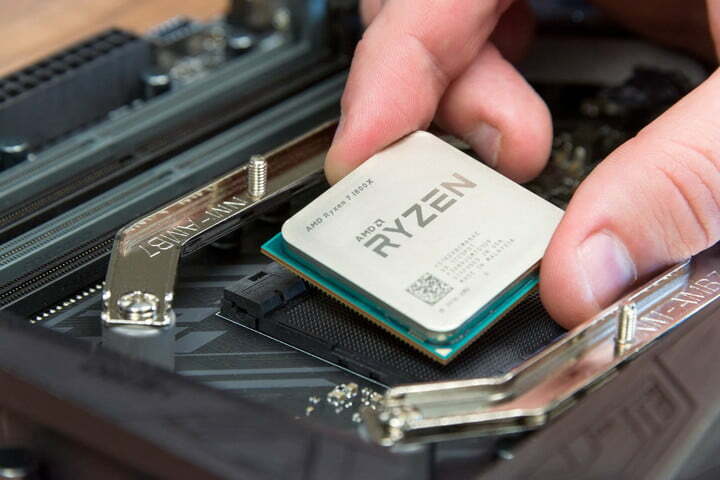 It includes six chipsets, all of which are paired with Socket 1331, the new do-it-all socket that will be used by all AMD processors going forward. Here, AMD is targeting a weakness of Intel, which currently uses two separate sockets, one for its main line processors, and the other for is high-end chips that boast six to ten cores. Intel also has a reputation for refreshing its socket every couple of processor cycles, while AMD promises to use Socket 1331 through 2020. That may give enthusiasts who jump on Ryzen now the chance to upgrade in the future without also buying a new motherboard. Though the AM4 platform is new, older FM2+ compatible coolers that use AMD’s clip attachment system will be compatible. AMD is also working with cooler manufacturers to provide retrofit kits for older AM3 and FM2+ coolers that don’t use the clip system, so check that out if you’re upgrading. It’s possible your existing cooler will work if you purchase new mounting hardware. Here’s how the specifications of AMD’s new chipsets break down. Keen eyes will notice the figures above are missing some important features, like PCI Express Generation 3 support. This is because the chipsets take a combination approach, adding their own features to the built-in SoC features of the Ryzen processor. Every Ryzen processor natively supports four USB 3.1 Gen 1 ports, 16x lanes of PCI Express Gen3 bandwidth, 4x PCI Express Gen 3 for high-speed NVMe solid state drives, and 4x PCI Express Gen 3 for chipset communication. Notably, the X300 and A/B300 chipsets, which target the ITX form factor, only use Ryzen’s built-in SoC features. They offer no additional connectivity of their own, though they do offer the features you’d expect from a motherboard, like secure boot and trusted platform module support. AMD hopes these simple chipsets will allow widespread adoption of low-cost ITX systems. As for RAM, all the chipsets will support DDR4 memory with speeds up to 2,667MHz by default, though users can insert faster RAM if desired, and expect it to work. Speeds above 2,667MHz will be considered overclocked, so keep that in mind when purchasing. Also, those going for the usual Dual Channel memory configuration should note that AM4 only supports memory up to 2,400MHz in Dual Channel configuration without overclocking. Ryzen is entering the market in an unusual position, as it’s both expensive, and looks like a great value. The most affordable version, the 7 1700 will be $329, while the 7 1800X we tested for this review is priced at $499. Most people spend quite a bit less than even $300 on a processor. Yet these processors, which all have eight cores and 16 threads, are targeting Intel chips that sell for at least $410, for the Core i7-6800K, to as much as $1,500, for the Core i7-6950X. The most affordable octo-core chip from Intel is the Core i7-6900K, which sells for $1,049 from most online retailers. Enthusiasts have long complained that Intel processors with more than four cores are ludicrously priced, and Ryzen precisely targets that vulnerability, selling its flagship 7 1800 for just $80 more than Intel’s most “affordable” six-core, the Core i7-6800K. 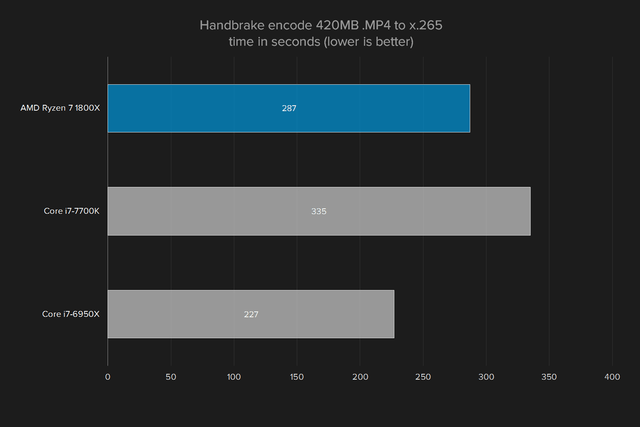 It appears this advantage will be widened by chipset pricing. The Ryzen 7 processor will work with a variety of chipsets, including budget models, if you determine you don’t need the benefits of the flagship X370 motherboards. Intel’s six, eight, and ten-core processors require X99, Intel’s most premium chipset, which tends to be priced above $200. There’s no doubt that AMD has, on paper, found a weakness in Intel’s product stack. Ryzen 7 undercuts Intel’s X99-based processors with ease, and the overall cost of the AMD Ryzen-based rig could be up to $1,000 less, if you’re comparing the AMD system to an Intel system running a Core i7-6900K and a high-end X99 motherboard. But does this on-paper advantage translate to real-world performance? Let’s have a look. This comparison pits the Ryzen 7 1800X against two of Intel’s best. The Core i7-7700K represents Intel’s fastest per-core performance with its base clock speed of 4.2GHz, and maximum Turbo Boost speed of 4.5GHz. The Core i7-6950X, meanwhile, represents the extreme cutting edge of Intel’s multi-core performance. It offers 10 cores, with 20 threads, and 25MB of cache. Let’s get on to the benchmarks. 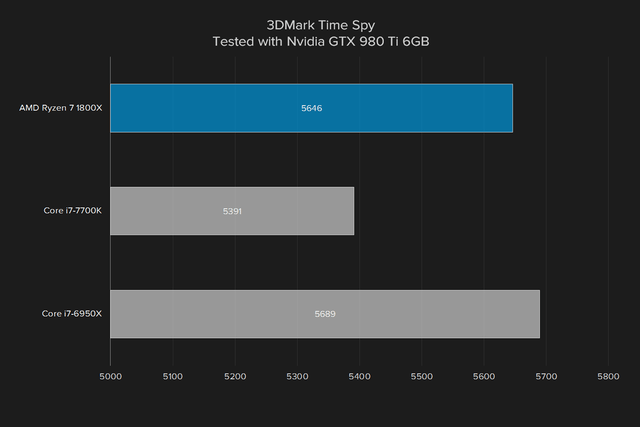 We tested a wider range of benchmarks here than we normally do, which can make it all a bit confusing. To break it down, we’ll talk first about single-core performance, then multi-core. Three of the benchmarks provide good examples of single-core results. 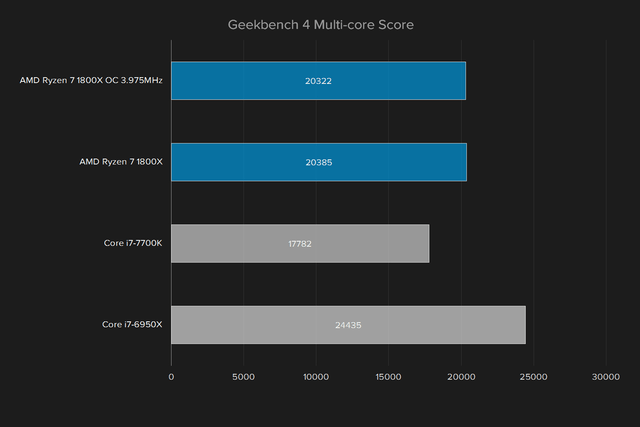 These are Geekbench 4 single-core, Octane, and Kraken. 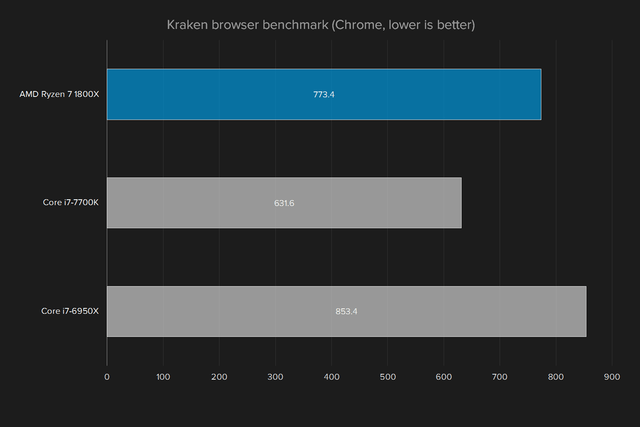 The latter two are browser benchmarks, and while they’re not strictly single-core in the same sense as Geekbench 4, they do tend to rely on stressing a single core above all others. These results aren’t favorable for the Ryzen 7 1800X. Though it has many cores, its base clock is 3.6GHz, and its boost is 4GHz. 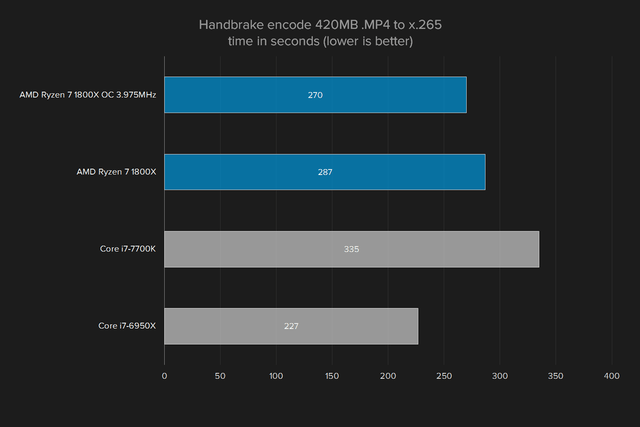 That puts it behind the clock speed of the Core i7-7700K – and it also appears, based on the tests, that AMD has not quite matched the IPC capability of Intel. The Core i7-7700K is over 25 percent quicker in Geekbench 4 single-core, and over 35 percent quicker in Kraken. With that said, though, the Ryzen 7 1800X does beat the single-core performance of the Core i7-6950X, which has a base clock of 3.2GHz and maximum Turbo Boost of 3.7GHz. But the eight-core, 16 thread Ryzen isn’t meant to be a single-core beast. 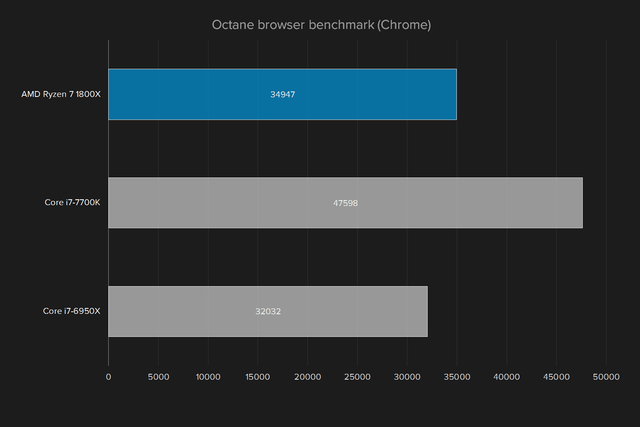 The real focus is on multi-core performance, and there, it ranges from good to extremely impressive. 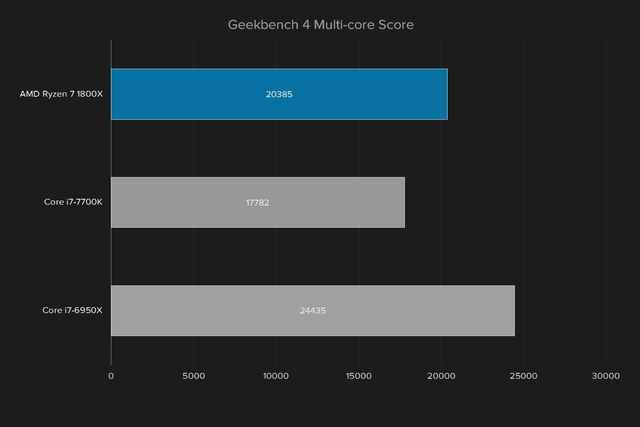 Let’s start with Geekbench 4 multi-core, which is among the least impressive results. There, the Ryzen 7 1800X manages a mere 15 percent victory over the Core i7-7700K. 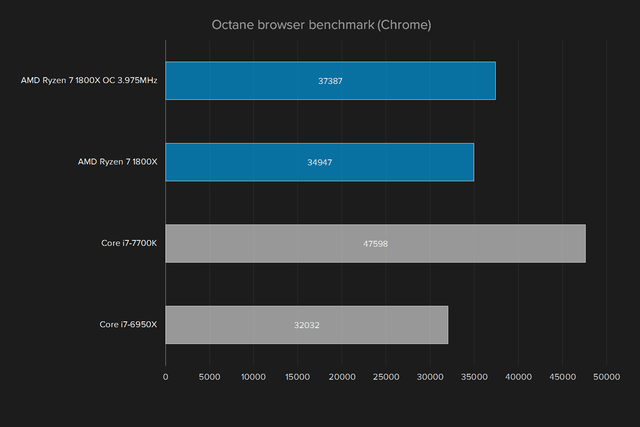 On the other hand, it’s also only 20 percent slower than the Core i7-6950X – which, remember, is a $1,500 chip. 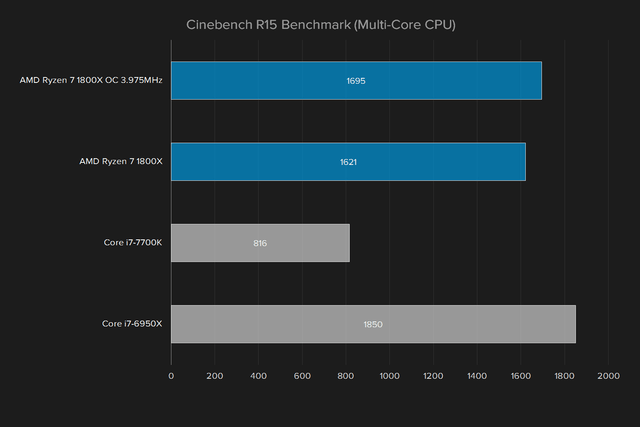 Ryzen is most competitive in Cinebench. There, it scores 1,621, which is almost double the Core i7-7700K’s score of 816. 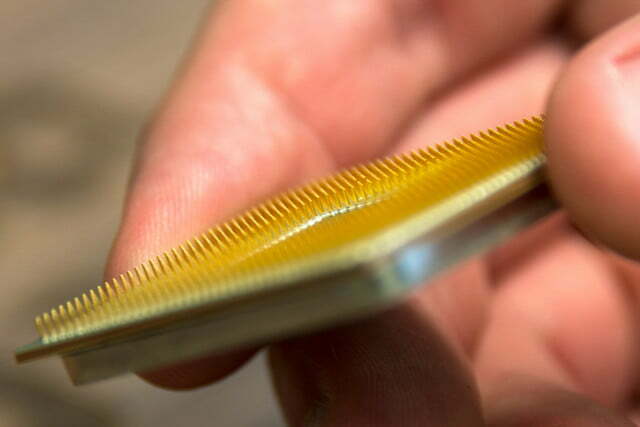 The Core i7-6950X scores 1,850, which is just 15 percent quicker than AMD’s $500 competitor. 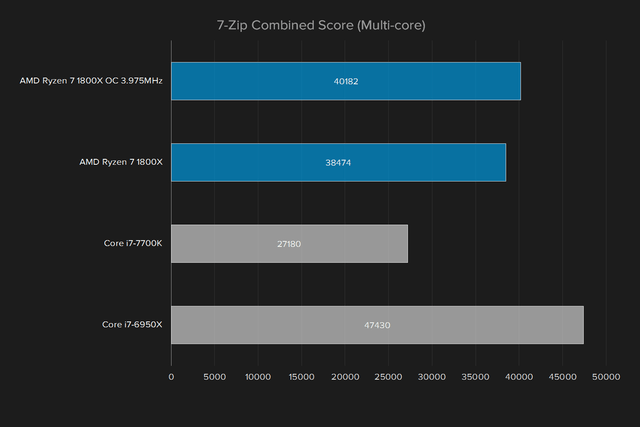 The Ryzen 7 1800X also scores very well in 7-Zip and Handbrake. In short, the performance story of Ryzen is essentially what we expected. 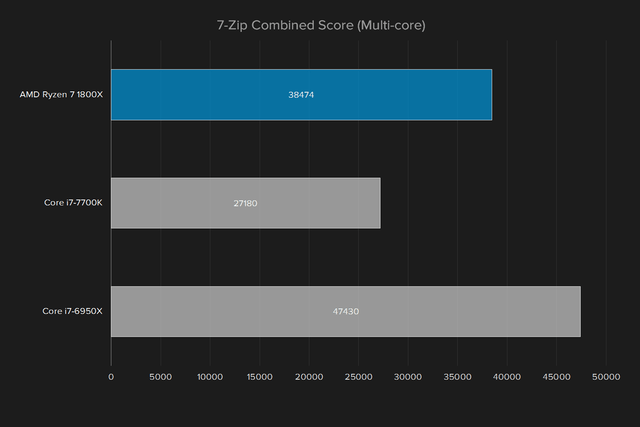 It doesn’t beat the Core i7-7700K in workloads that don’t stress many cores, but it outpaces it or absolutely demolishes it in many-core workloads. 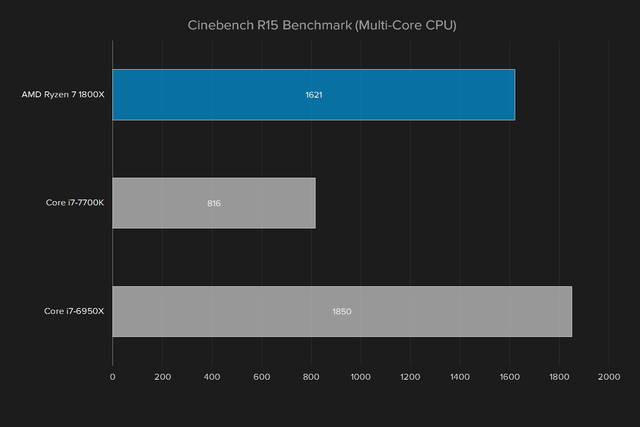 At times, as in Cinebench and Handbrake, the 7 1800X gets close to the Core i7-6950X, despite Intel’s $1,000 premium over its competitor from AMD. Prosumers and workstation users are going to be very, very interested in what Ryzen offers. AMD’s marketing of Ryzen has focused heavily on prosumer and workstation systems, but the company also showed several gaming demos coming up. However, the demos usually pit Ryzen against a Core i7-6800K or i7-6900K, neither of which are chips gamers buy. The Core i7-7700K is the flagship CPU for modern gamers. Can the Ryzen 7 1800X stand up to it, or exceed it? In 3DMark, which includes some demanding processor tests, the Ryzen 7 1800X does beat the Core i7-7700K. But its victory ends there. 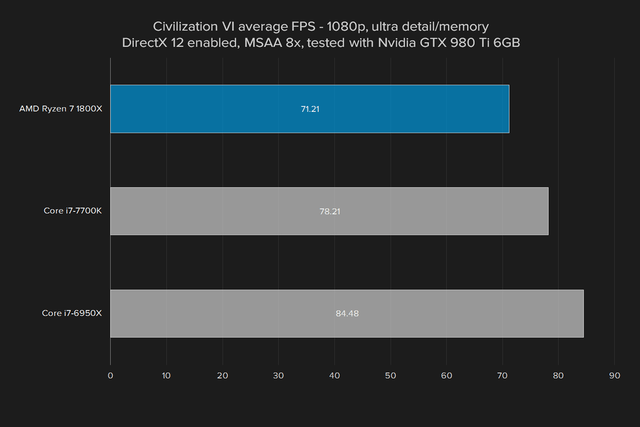 We also tested the game in For Honor, which is rendered in DirectX 11, and Civilization VI with DirectX 12 turned on. 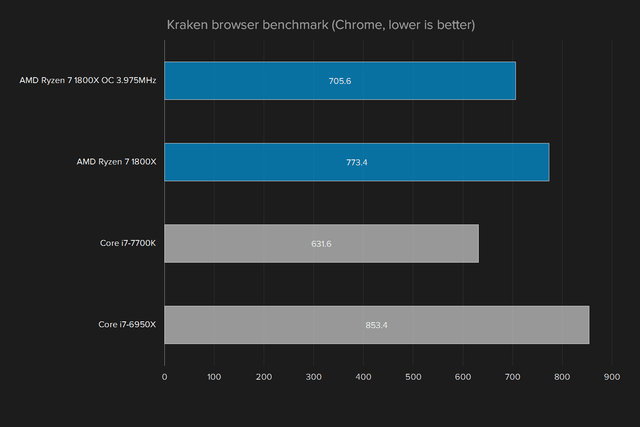 In both cases, the Core i7-7700K was quicker. The difference varied, based on the game and the settings. 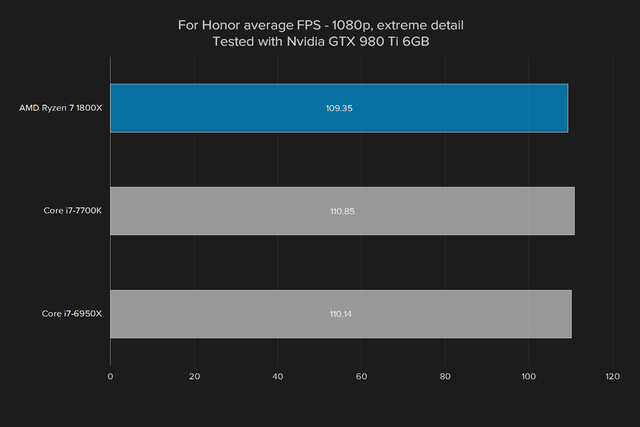 We saw no difference when testing For Honor at extreme detail and 1080p resolution, with a GTX 980 Ti installed. 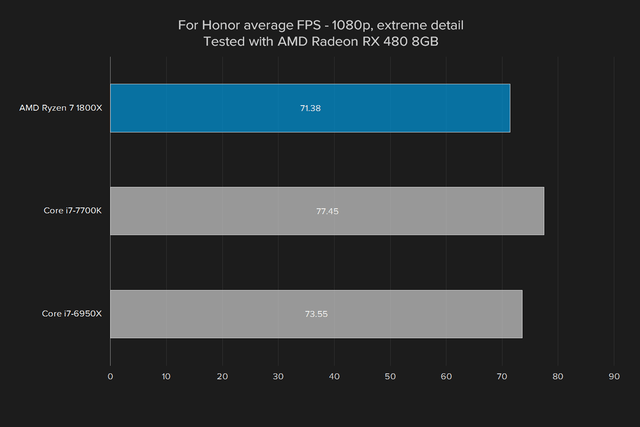 However, inserting an AMD Radeon RX 480 and testing at the same settings yielded an eight percent difference in favor of Intel. The greatest difference in favor of Intel came in Civilization VI at extreme detail, where the Core i7-7700K was up to 15 percent quicker. 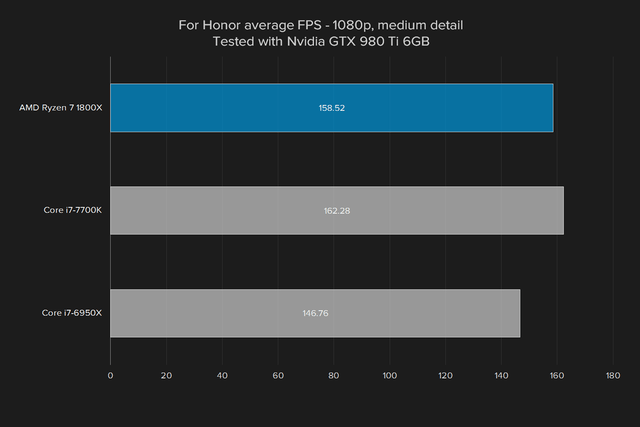 This result may not be what’s expected, as pairing the AMD processor with the AMD card nets slightly worse performance than pairing with an Nvidia card. 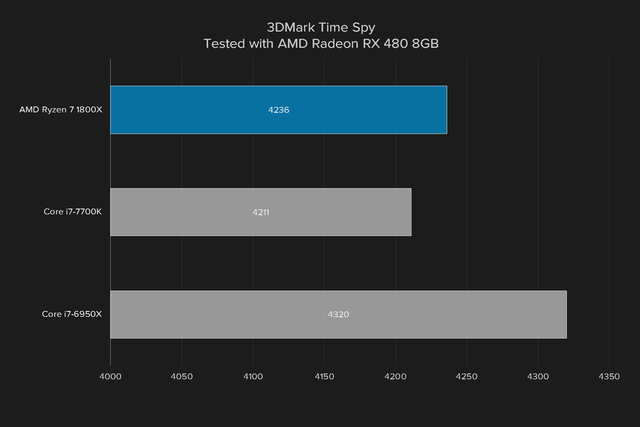 However, there’s nothing about the architecture of the RX 480 series that leads us to think it would work better with Ryzen than any other card, and our test results were consistent across multiple runs. Even at its very best, the Ryzen 7 1800X only matched the less expensive Intel Core i7-7700K, and Ryzen did not win in any game benchmark besides 3DMark Time Spy. The focus is on multi-core performance, and there, Ryzen ranges from good to extremely impressive. A difference of 15 percent is modest in any case, but it’s not insignificant. And remember that the Ryzen 7 1800X is quite a bit more expensive than the Core i7-7700K. 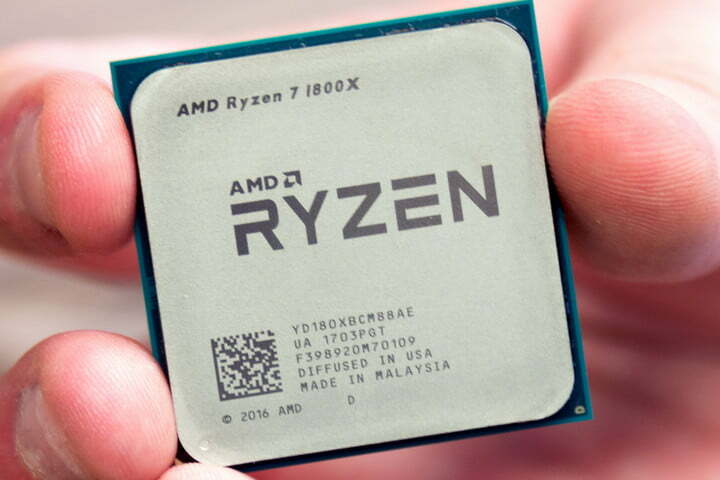 The true competitor to the Intel quad-core is AMD’s Ryzen 7 1700, which has a base clock of 3GHz – 600MHz below the base clock of the 1800X. We are currently testing that processor. Gamers, it seems, are likely to remain best served by an Intel Core i7-7700K, or some less expensive variant, like the Intel Core i5-7400. Superior IPC remains relevant to games, and it doesn’t appear AMD can beat Intel in that area. However, Ryzen is at least in the ballpark, which means those interested in the chip for its excellent multi-core performance won’t have to sacrifice their enjoyment of games. In fact, the Ryzen 7 1800X is very competitive with the Core i7-6950X in games, despite the price gap between them. As mentioned, AMD quotes a base clock of 3.6GHz for the Ryzen 7 1800X, with a maximum “Precision Boost” clock of 4GHz. This, however, is only the short version of the story. Ryzen processors use a rather complex system, called SenseMI, which monitors chip’s power draw and temperature via numerous, interconnected sensors. The processor then runs this telemetry through “machine intelligence” algorithms, with the goal of maximizing clock speed based on workload and thermal headroom. The maximum Precision Boost is not what’s guaranteed at all times. Instead, the processors bumps the maximum boost frequency up or down, in 25MHz increments, as it deems appropriate. Precision Boost can also exceed promised clock speed limitations if a high-efficiency cooling system makes it possible. AMD calls that capability XFR, and it’s only available in Ryzen chips with the “X” suffix. That sounds great, but it’s enabled by default, and enthusiasts will want more control. Thankfully, AMD provides that as well. Ryzen owners can change clock speed, voltage, memory speed, memory timings, and more, all within Windows, using the new Ryzen Master software. The utility will prove familiar to anyone with a Radeon video card, as the controls are similar to the Wattman utility AMD introduced for Radeon last year. Ryzen Master lets users set clock speed at whatever is desired, powered by whatever voltage is desired. It’s even possible to disable cores to increase the clock speed of the chip, a task of limited purpose, but one that will call to certain enthusiasts looking to temporarily maximize single-core performance for specific situations. Ryzen Master is the easiest CPU overclocking utility we’ve seen yet, and changes take over as soon as you hit the “Apply” button. It’s a shame, then, that Ryzen seems to have limited overclocking potential. We had a hint of this going in. The warning signs came from AMD’s own Ryzen conference, where we were informed a clock speed of 4.1GHz across all cores would be considered respectable. Our own efforts weren’t as fortunate. After some tweaking, we landed at a maximum stable clock speed of 3,975MHz, with processor voltage increased from the default of 1.35v to 1.45v. That, you might note, is below the maximum Precision Boost clock. But boosting cores as necessary is quite a bit different, and more tasking, than overclocking all of them to run at a set clock speed in tandem. Having increased the clock speed, we re-ran our test suite, and found mediocre results overall. While scores did improve slightly in some benchmarks, the gain was generally below 10 percent. 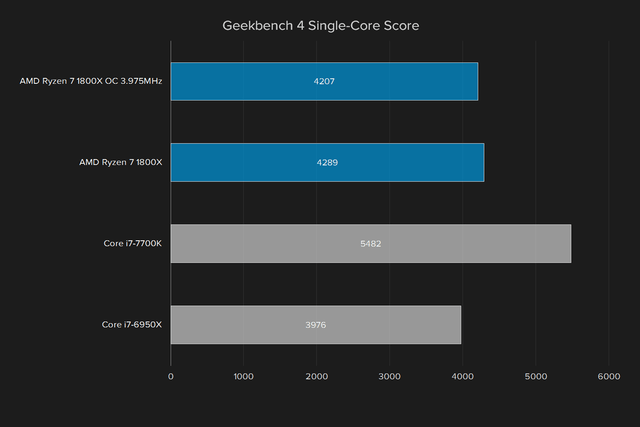 By contrast, we’ve tested Core i7-7700K processors at speeds up to 5GHz. We’ve also witnessed Core i7-6950X processors overclocked up to 4.5GHz, a 1.5GHz increase above stock. As always, any individual overclocking result should not be taken as gospel. Results can vary substantially from chip to chip. However, AMD said nothing that would lead us to believe that Ryzen’s expected to stray into the mid-4GHz range. It’s also worth noting that AMD sent us a Noctua air cooler for our review, which is certainly better than average. We reached out to AMD for comment on the results, and the company stated we may do better if a water cooler was used. That is likely true — but we’ve succesfully overclocked past Intel Core chips by up to 800MHz on air cooling. AMD provides a three-year limited warranty for processors sold direct to retail. The warranty covers the usual defects, but doesn’t cover damage caused by improper installation, or overclocking. These terms are standard for the industry. Ryzen is finally here, and as hoped, it marks a return to competition for AMD. 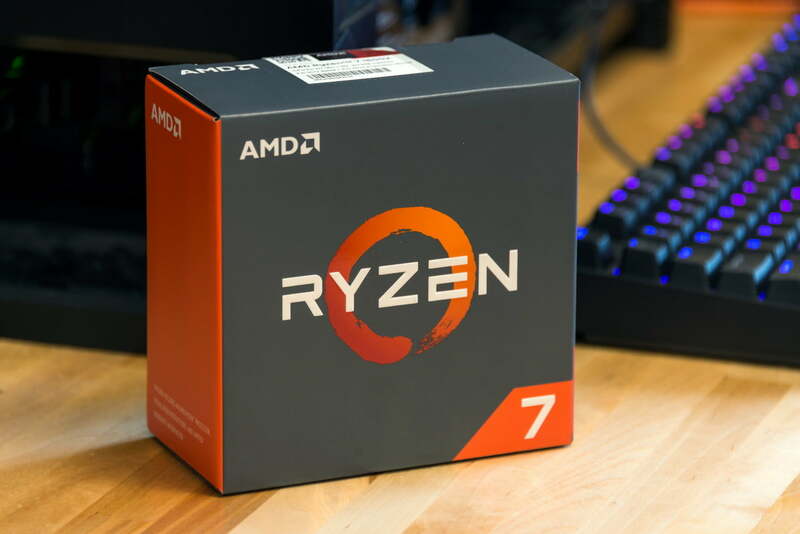 The Ryzen 7 1800X we tested for this review scored surprisingly close to the Core i7-6950X, a processor that sells for $1,000 more, and the chip easily beat the Core i7-7700K in multi-core tasks. While not affordable at $499, the 1800X is certainly attractive to prosumer and workstation users. It’s not a clean sweep, however, and it’s not a complete upset. Intel still has an edge in other tasks, like gaming, due to high base clock speeds and aggressive Turbo Boost maximums. The advantage you see from Ryzen depends entirely on how often you run programs that can task up to 16 processing threads. Ryzen also showed poor results in overclocking, which is sure to disappoint enthusiasts. The Ryzen 7 1800X is an excellent choice for anyone who needs a processor to tackle heavily multi-threaded work. It punches way above its weight, targeting the Core i7-6900K and Core i7-6950X. Ryzen also enjoys a slightly more affordable chipset and a more promising line-up of future upgrades, at least when compared to the Intel X99 chipset. If you’re looking to play games, though, the Core i7-7700K is still king. Its excellent base clock speed and significant overclocking headroom help it retain that crown without issue. AMD’s Ryzen may be the most future-proof CPU in the business. 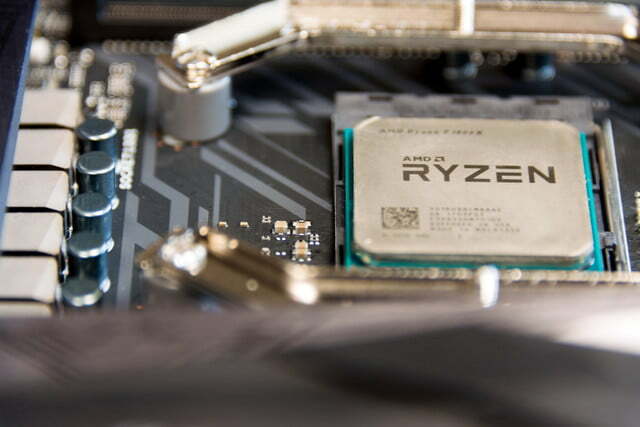 Heavily threaded workloads are the future, and the new AM4 platform used by Ryzen should be relevant through 2020, unless AMD breaks its promise. A system built on Ryzen should last many years. Yes, though only if you need a processor for multi-threaded work, or you want a processor on a platform that has a nice, long life ahead of it. Ryzen’s aim for the gap in Intel’s armor is true, but the market it targets is only a slice. Those who need the absolute fastest processor for multi-core tasks should still choose the Intel Core i7-6950X, and gamers should still pick a Core i7-7700K.